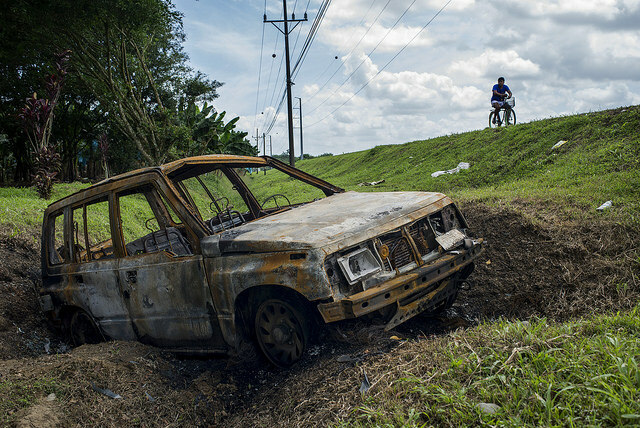 SAN JOSE, Mar 18 2015 (IPS) - A strike that has brought activity to a halt since January on three major banana plantations on Costa Rica’s southern Caribbean coast, along the border with Panama, has highlighted the abuses in a sector in the hands of transnational corporations and has forced the governments of both countries to intervene. 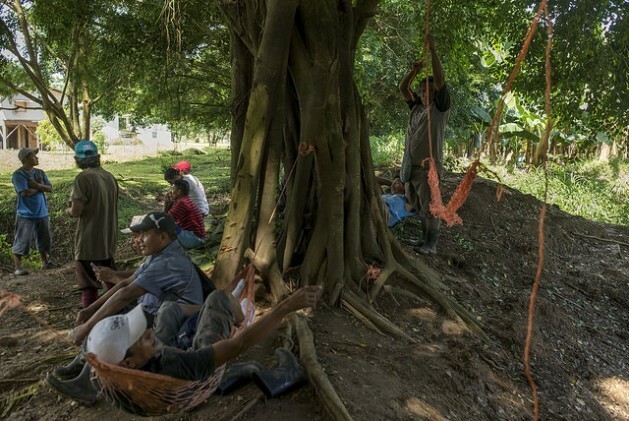 More than 300 labourers, almost all of them indigenous Panamanians working on plantations for a branch of the U.S. corporation Fresh Del Monte, have been on strike since Jan. 16 to protest harassment of trade unionists, changes in schedules and working conditions, delayed payment of wages and dismissals considered illegal. “The company laid us off on Dec. 31 and when it rehired us on Jan. 3 it said we were new workers and that any modification of the work applied to us. But according to legal precedent, to be considered a new worker at least a month has to go by,” Federico Abrego, one of the striking workers from Panama, told Tierramérica by phone from the area. Abrego and most of the more than 300 workers on strike on the Sixaola plantations 1, 2 and 3 belong to the Ngöbe and Bugle indigenous groups, who live in a self-governed indigenous county in Panama across the border from Costa Rica, where many go to find work. Between 70 and 90 percent of Panama’s 417,000 indigenous people live in poverty, according to a 2014 United Nations report. Observers say the latest conflict between workers and Fresh Del Monte in the Caribbean municipality of Talamanca, 250 km southeast of San José, is the result of decades of accumulation of land on Costa Rica’s Caribbean coast, mainly by large foreign banana producers, but in recent years by pineapple growers as well. Talamanca is in the second-to-last place among the country’s 81 municipalities in the United Nations Development Programme’s (UNDP) Human Development Index. Most of Talamanca’s population is indigenous, and banana and plantain plantations cover 37 percent of the territory. “In December the contract with Corbana expired, and when they renewed it, the company did something that infringed the rules: they set up a new union, dismissed all of the workers, and only hired back those who were in the new union. The new conflict broke out as a result,” said Vargas, of the left-wing Broad Front coalition. Corbana was created by the government and the owners of banana plantations to bolster production and trade. In the past it also produced bananas on land that it now leases to companies that basically use the property as their own. Abrego is a classic example of these plantation workers. The 53-year-old Gnöbe Indian has been working on banana plantations in Costa Rica since 1993. He now lives with his wife and eight children, half of whom are still of school age, in a house that belongs to the Banana Development Corporation (Bandeco), a branch of Fresh Del Monte. “My fellow strikers ask me about the food and tell me the same thing my family tells me at home: that they don’t have anything to eat while we’re waiting to be rehired,” said Abrego, the leader of the trade union at the Sixaola 3 plantation. “I’m trying to get by without an income, with what I can scrounge up. But there are guys with small children who are having a harder time,” he said with a heavy heart, before explaining that the striking workers prepared communal meals to survive. The strike escalated when banana workers from Panama blocked traffic for a number of hours on the bridge over the Sixaola river, which connects Costa Rica and Panama, on Feb. 20-21. The roadblock and the fact that the strike is being held by Panamanians on a Costa Rican plantation forced both governments to establish a negotiating table after an agreement reached on Feb. 27, which is to deliver its recommendations in a month. Taking part in the talks are representatives of Bandeco, the local branch of the Sitepp (Sindicato de Trabajadores de la Empresa Pública y Privada) trade union, Costa Rica’s Ministry of Labour and Social Security, and Panama’s Ministry of Labour. Besides the creation of the binational commission and its report, the agreement included “the company’s promise to immediately rehire 64 workers and to not evict the dismissed workers from their homes,” Costa Rica’s Deputy Minister of Labour Harold Villegas told Tierramérica. The plantations in Costa Rica’s Caribbean coastal region are the scenario of frequent conflicts between workers and the big banana companies, and the current strike on the Sixaola plantations is just one example. In 2013, Sitepp held a strike to protest poor working conditions and the complaints are piling up in the Ministry of Labour. In May 2014, an inspection by the ministry revealed a number of violations of the country’s labour laws and ordered the companies to redress them. The union leaders complain that despite the binational agreement, they have not yet received food support from the institutions, although the 64 workers covered by the accord were rehired. A large proportion of the banana industry is in the hands of transnational corporations. Besides Fresh Del Monte, there are branches of other U.S. firms like Chiquita Brands, which controls 24 percent of the country’s banana exports, or the Dole Food Company. The banana industry carries a heavy weight in the country, especially the Caribbean coastal region. According to statistics from Corbana, it employs 6.2 percent of Costa Rica’s workforce and 77 percent of all workers in the Caribbean region. The industry represents seven percent of the country’s exports, and last year it brought in 900 million dollars.